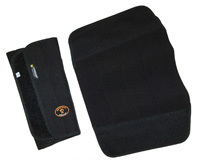 Dry Suits/Undergarments → Golem Wraps "gators"
Calf wraps for your dry suit. Two sizes (M and L). Made of heavy duty Cordura with extra strong overlaping hook-and-loop closures. Segmented elastic back. Tight and comfortable. Great gators for the price and well constructed. Fantastic value for a very useful product. I wouldnt dive dry without them! Use these every dive and absolutely love them! Very sturdy construction. ya great quality and does the job! They are great. The only thing which surprised me was - there was no GOLEM gear logo ... quite shame. Other than that, awesome.